Helmets seem to be all the rage these days on the field and the Ops-Core FAST Bump and helmets fashioned after it are a popular choice. The Raptors Airsoft RTV helmet is one of those popular alteratives to the real deal and I got one in my meat mitts to try out on my melon. The RTV comes with all the bells and whistles you might want, like authentic styling, adjustability and rails for accessories, but the big difference between this helmet and the real thing is this airsoft-only helmet is in tune with any airsofter’s budget. The Raptor helmet certainly simulates an authentic helmet with an NVG rhino mount. The Raptors’ RTV airsoft specific helmet is right on target for the airsoft enthusiast who wants the look and functionality of a real helmet at a low price point. The fit and weight are good, but the NVG plate may be a little delicate if mounting up a weighty system. For a helmet in this price range it’s got a lot going for it. 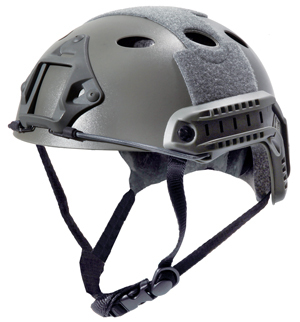 Raptors’ RTV is a lightweight helmet constructed of a polymer plastic shell and Styrofoam internal mold, much like a bicycle helmet, which is why this is for airsoft use only! The suspension system is a simple strap going under the chin. It’s easy to adjust and pretty comfortable. The adjustment options are limited to the straps and some removable/adjustable internal padding which seems to allow it to fit a variety of heads—unless of course you were dropped as a child and have an odd shaped dome. This brain bucket also features the NVG mount and rails on both sides. 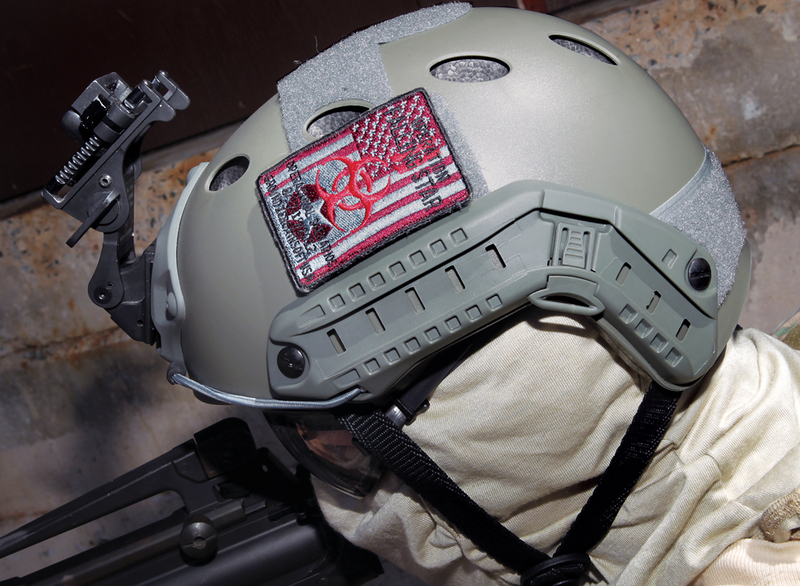 The front NVG plate allows you to attach a standard USGI-style arm. You can also fit the Go Pro NVG mount for a stable helmet cam mounting option. 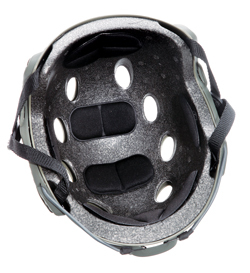 The rails located on either side of the helmet allow for the attachment of helmet lights, cameras, and goggles. It comes with a set of thin strap goggle mounts that clip into the rails. Velcro? Yeah, it’s got it and a good amount, too. There is a strip running across the back of the helmet as well as one coming over the top and running from side to side. The edges are large enough for a flag sized patch. You can put anything that takes Velcro on here. Finally, the color: our test sample came in Foliage Green, but it’s also available in Black and Dark Earth. A look at the inside of the helmet shows a number of removable pads to fine tune fitment to different head sizes. After a quick inspection I was impressed with the color, venting and weight of the RTV Helmet, especially when considering this can be picked up for under fifty beans. I dug into my accessories and was able to fit my Rhino Arm on with no issue and even found it held a replica PVS-14 with no problem. One thing to remember is that it’s only made of plastic so those of you using real night vision which weighs more should use caution as it is not steel like the real one. The fit was good overall and I tweaked the straps and internal pads so the helmet was tight and comfortable. To give you an idea, I wear a small/medium hat. The other guys in the Airsoft Insider offices, however, wear a large to extra-large hat and they felt the Raptor was a bit too tight even after messing with the included optional pads. The real test came out in the fields at Ground Zero Airsoft in Connecticut. I wore the helmet in play for several hours and it remained comfortable. There was minimal shift while running and a round or two even bounced off with no damage to the helmet plastics. My goggles, too, stayed in place with the rear Velcro and the ability to tack on some patches to represent is a nice feature. This helmet gets you the desired look of a high speed guy without the hefty cost that usually follows. It may not be up to par for NVG users but they should just get a real helmet too. The RTV is comfortable, adjustable and looks the part when gearing up for play; add in the fact that its light weight means you’ll spend more time concentrating on what’s in front of you rather than messing with what is weighing you down.